Dimensions 1 by 7.50 by 6.25 in. Amazon.com description: Product Description: With its sweeping, inclusive view of American history, Created Equal emphasizes social historyâincluding the lives and labors of women, immigrants, working people, and minorities in all regions of the countryâwhile delivering the familiar chronology of political and economic history. By integrating the stories of a variety of groups and individuals into the historical narrative, Created Equal helps connect the nationâs past with the studentâs present. Created Equal explores an expanding notion of equality and American identityÂÂ-one that encompasses the stories of diverse groups of people, territorial growth and expansion, the rise of the middle class, technological innovation and economic development, and engagement with other nations and peoples of the world. 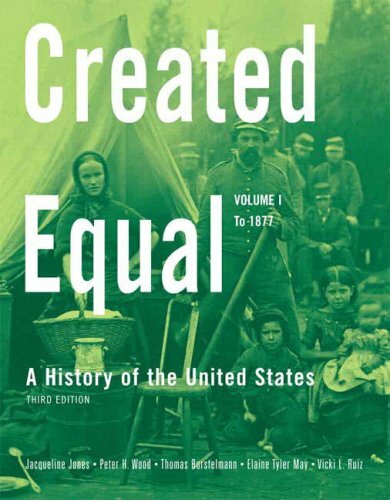 4 lslf edition from Prentice Hall (July 22, 2013); titled "Created Equal: A History of the United States: To 1877"
5 pck pap/ edition from Prentice Hall (February 12, 2016); titled "Created Equal: A History of the United States: To 1877"
4th edition from Prentice Hall (December 22, 2013); titled "Created Equal: A History of the United States: To 1877"
4th edition from Prentice Hall (July 18, 2013); titled "Created Equal: A History of the United States to 1877"
3 brief edition from Prentice Hall (July 15, 2010); titled "Created Equal: A History of the United States: to 1877"
About: Explores American History through the theme of equality. 3 pck pap/ edition from Prentice Hall (August 30, 2009); titled "Created Equal: A History of the United States: To 1877"
About: With its sweeping, inclusive view of American history, Created Equal emphasizes social history–including the lives and labors of women, immigrants, working people, and minorities in all regions of the country–while delivering the familiar chronology of political and economic history.